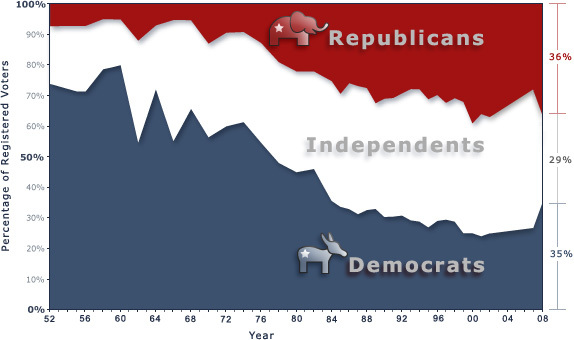 Full Source: 1952-1977: Calculated by authors from the Texas subset of the American National Election Studies cumulative data file, 1948-2000 (Virginia Sapiro, Steven J. Rosenstone, and the National Election Studies, 11th ICPSR version. Ann Arbor, MI: University of Michigan, Center for Political Studies [producer], 2002. Ann Arbor, MI: Inter-university Consortium for Political and Social Research [distributor], 2002). 1978-1983: Annual surveys conducted by the Center for Public Policy, University of Houston. Cited in Richard Murray and Sam Attlesey, "Texas: Republicans Gallop Ahead", (1999), p. 339. 1983-1998: Calculated by authors from Texas Poll data provided by the Office of Survey Research, University of Texas at Austin. 1999-2002: From various published tabulations of Texas Poll data. Note that data from 1984 to the present is annual but from 1952-1984 is either quadrennial or biennial. To annualize earlier observations we interpolated using the simple average of available prior and subsequent annual observations.